fatigue, discover better nutrition and exercise choices, understand new treatment choices, and learn better ways to talk with your doctor and family about your health. 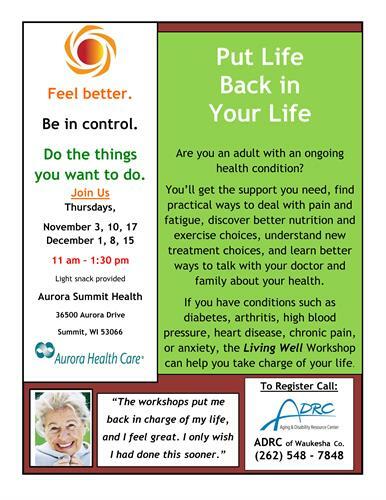 If you have conditions such as diabetes, arthritis, high blood pressure, heart disease, chronic pain, or anxiety, the Living Well Workshop can help you take charge of your life. To Register Call: ADRC of Waukesha Co.